Here's a fast, simple Valentine card as I wrap up the final cards I'm making to send to out-of-town family. 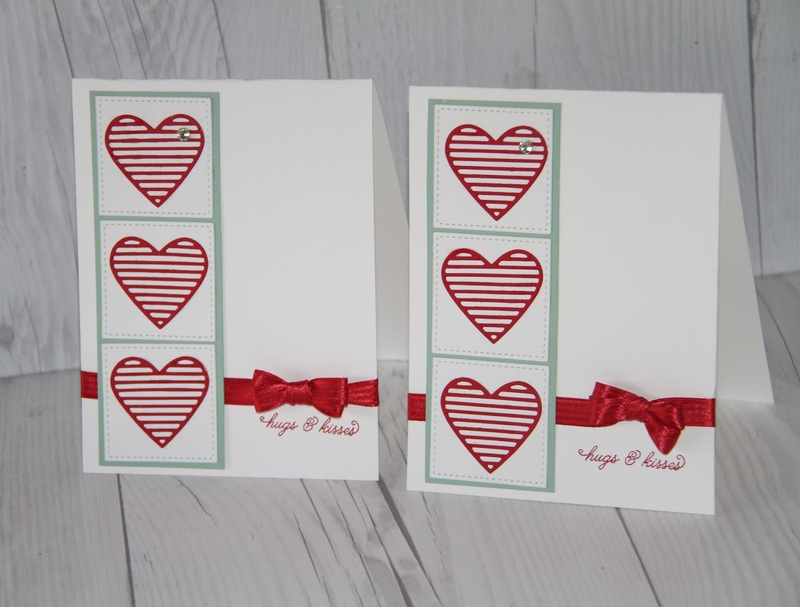 This card uses the Sealed with Love stamp set and the matching Love Notes Framelits Dies. This year I tried to keep all of my cards coordinated using just Real Red, Whisper White, Basic Black and Mint Macaron, so not only could I send them to to family, but the duplicate of each card would coordinate on my display boards. The Stitched Shapes framelits create perfect squares with very polished finish. You won't find these framelits in the catalog. They are coming in June with the new catalog. But you can purchase them now using item number 145372. 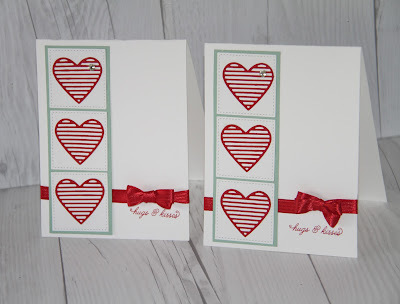 If you think it is too late to order this stamp set and matching dies, believe me, its not! I'm planning to use this set for cute little love notes to leave around the house for my dear husband (don't spill the beans) or in his back pack and computer case. There are so many cute pieces to this set, it can be used for embellishing scrapbook pages, 3 X 3 love notes, tags and ideas I haven't even thought of yet. Live near NW Houston-F.M.1960-Spring area in Houston? Check out the Valentine treats we'll make during our Feb 12 class. Details and registration are listed on my MeetUp site. Come, meet new people, and stamp the afternoon away! Become a hobby demonstrator and enjoy discounts on all your purchases. Enjoy 20-25% product discounts as a Stampin' Up! hobby demonstrator. Make new Friends. Or, be Your own Boss; Work your own hours, and do something you love! This is the best time of the year to sign up as a demonstrator, with extra benefits from Sale-A-Bration, and extra sign up bonuses. Sign up as a hobby demonstrator for $99 and get $125 in merchandise that YOU select plus an additional 2 free stamp sets. 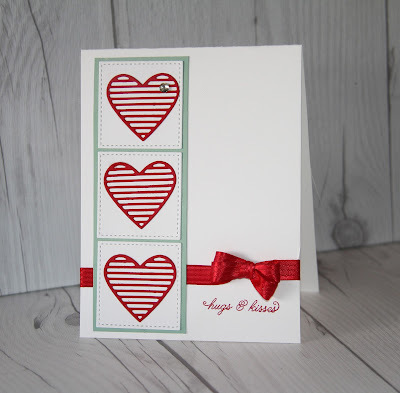 Pick stamps that fit your stamping or scrapbooking style. Your kit also includes business supplies, catalogs, and your starter kit ships free! Fill your Occasion catalog wish list. Or turn your hobby into a business and earn extra money for an upcoming vacation or family expenses based on your sales and recruiting.